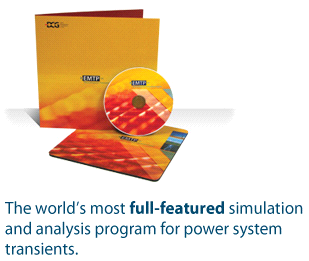 Simulation of power systems has never been so easy. The EMTP-RV package combines a powerful computational engine with superior modeling flexibility and drag-and-drop simplicity. EMTP-RV is suited to a wide variety of power system studies, whether they relate to project design and engineering, or to solving problems and unexplained failures. General purpose circuit analysis: wideband, from load-flow to steady-state to time-domain. Simulation and analysis of power system transients: lightning, switching, temporary conditions. Detailed simulation and analysis of large scale (unlimited size) electrical systems. Network analysis: network separation, power quality, geomagnetic storms, interaction between compensation and control components, wind generation. Synchronous machines: SSR, auto-excitation, control. Want to find out more? Join us for live Webinar! A Webinar is an easy way for us to instantly share a presentation on the functionalities of EMTP-RV, While enabling you to ask questions in real time from your office. EMTP-RV computational engine is driven by EMTP Works. The bulk data transmission from EMTP Works to EMTP-RV is performed using a Netlist file. EMTP-RV reads the Netlist file, decodes the simulated network topology, finds all required device models and computation functions, builds the system matrix and performs the simulation. The simulation results are saved into binary and ASCII files. The main binary file is used for showing simulation waveforms from a stand-alone waveform visualization application named ScopeView. Some of such output files are HTML files and can be viewed only through the Internet Explorer Program. As of December 1, 2006, all marketing and support for EMTP are being adopted by CEATI. CEATI brings to the table over 30 years of experience in technology development in power systems. In addition, the existing EMTP-RV technical team, with their knowledge and years of experience, remain devoted to product development and support. Our goal with these changes is to ensure a seamless transition, the best possible support for our customers and ongoing product development.